Dent is beautiful, quaint, remote and worth the visit, but next time I will take the bus. Minolta A1 at 28mm equivalent. F8 @ 1/640 @ ISO 100. Programed auto. Punch and Sharpen landscape presets in Lightroom. Blackpoint to the right considerably, and heavy Recovery for the sky (and even then the lightest clouds are blown). Cropped slightly from the top. Driving north over the top of the western Yorkshire Dales on a moody, dark, rainy day, we came to these fields of Heather…the first we had seen in England. Hours later, after a visit to the town where All Creatures Great and Small is set, we came back over the same road as the weather was breaking and stopped for a series of pictures. 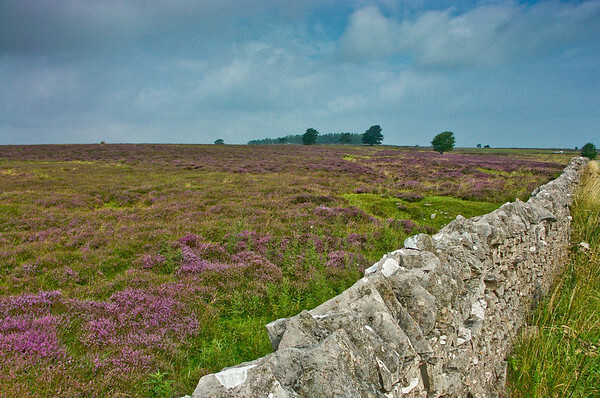 I found the stone wall compelling in contrast to the heather. Minolta A1 at 28mm equivalent. F8.0 @ 1/640 @ ISO 100. Programed auto, tilted exposure to emphasize the sky. Even with the tilted exposure, which left the foreground too dark, the Minolta’s sensor could not capture the detail in the sky. The original of this looks dark with a washed out sky. Very disappointing. In Lightroom, after applying the Punch and Sharpen landscape presets, I was able to use Fill Light to restore detail in the foregound and a Graduated Filter effect to bring up the detail in the sky. Blackpoint just to the right. Slight added contrast. A touch of brightness overall. Cropped from the bottom to eliminate a distracting white stone in the wall. This is clearly an example of software over sensor photography. Still I have to say that the Minolta’s 5mp sensor did capture the detail needed. The internal software simply could not render it into an effective image. Lightroom to the rescue…that is not my style…generally post-processing is previsualized and part of my creative process at the point of capture. The Minolta however, did not lend itself to that process. Still, it is the final image that counts. And I find this one true to the memory of the day. This meadow is maybe 7/8s of the way around the Grasmere-Rydal Water loop, and what I remember vividly is how tired I was by this point. We had to hike down a side path and climb back up to the road (we were off the end of the path and back on roads by then) and at the time I was not sure it had been worth the side-trip. Of course, now, looking at the image, I can say it was worth it. Minolta A1 at 28mm equivalent. F5.6 @ 1/200th @ ISO 100. Programed auto. Punch and Sharpen landscape presets in Lightroom. Blackpoint slightly to the right, and Recovery for the clouds. And little wonder. 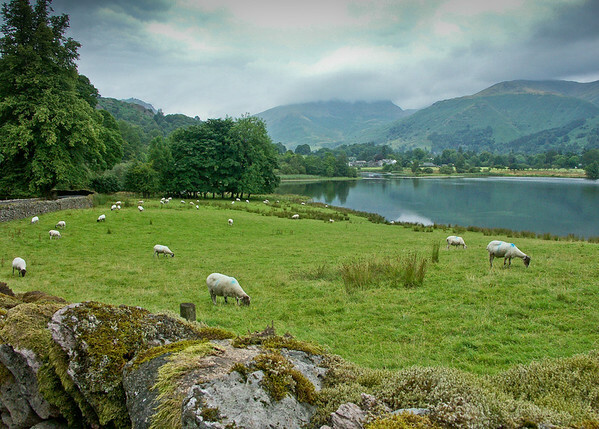 This view of Grasmere might have been better if the day had allowed a view deeper into the mountains behind the lake. There are higher peaks under the clouds. But it is still atmospheric and all too typical of a summer’s day in England. We actually made it all the way around the lakes without getting wet that day, but it was a close run thing. Minolta A1 at 28mm equivalent. F5.6 @ 1/250th @ ISO 100. Programed auto. Punch and Sharpen landscape presets in Lightroom. Blackpoint to the right just slightly. Recovery for the sky. 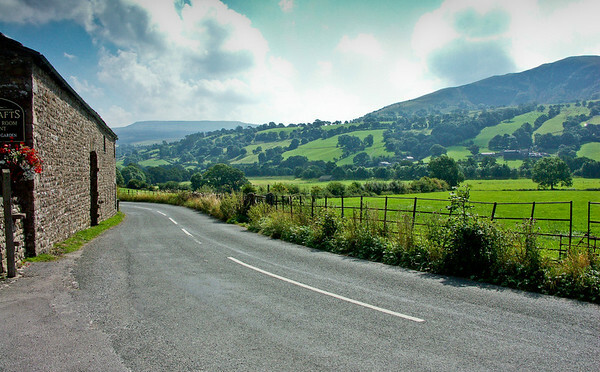 John Ruskin, Victorian art critic, philosopher and writer, champion of Lake District painters and J.M.W Turner in particular, claimed that this was the most perfect view in all of England. 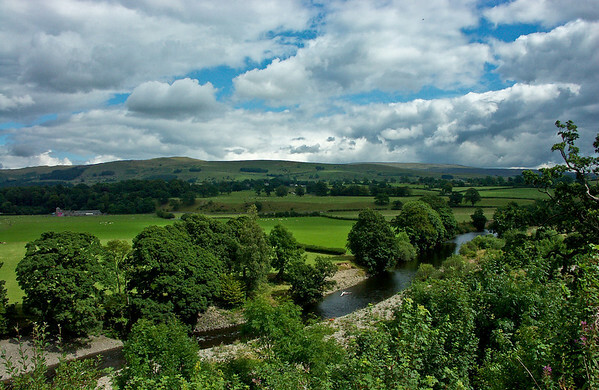 There are signs all through the town of Kirkby Longsdale directing you to this spot, and a big brass plaque and stone bench to help you enjoy it. And I suspect it looks today just about as it did in Ruskin’s time. And I suspect this is just such a day as the day on which Ruskin drew his conclusion. Minolta A1 at 28mm equivalent. F8.0 @ 1/640th @ ISO 100. Programed auto. Sharpen landscape and Punch presets in Lightroom. Blackpoint to the right. Some Recovery for the clouds. We spent a late afternoon/early evening in the little town at the edge of the Dales called Skipton. 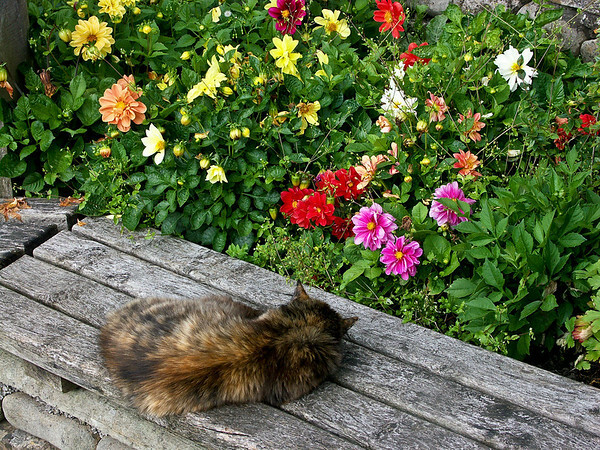 This cat was decorating the bench outside the small Tourism Center where we went to gather information on the north west corner of the Dales, soaking up the last of the sun and the gathered warmth of the bench. With the flowers in the backgound, I could not resist. Minolta A1 at 70mm equivalent. F5.0 @ 1/200 @ ISO 100. Programed auto. Punch and Landscape sharpen preset in Lightroom. Blackpoint just slightly to the right. 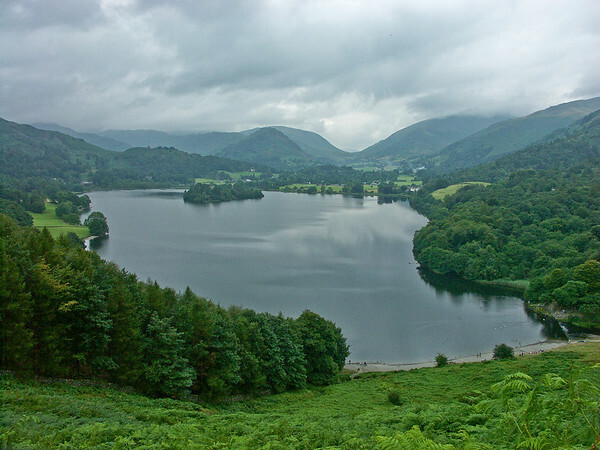 We hiked the circuit of Grasmere and Rydal Water, starting from Grasmere and going across the ridge above Rydal past two Wordsworth dwellings and then back on the other side, catching views made famous in hundreds of paintings, Turner’s among them. Totally amazing! One of the best days of my life despite doddgy weather that closed the more distant views of the mountains behind Grasmere, and very tired feet. 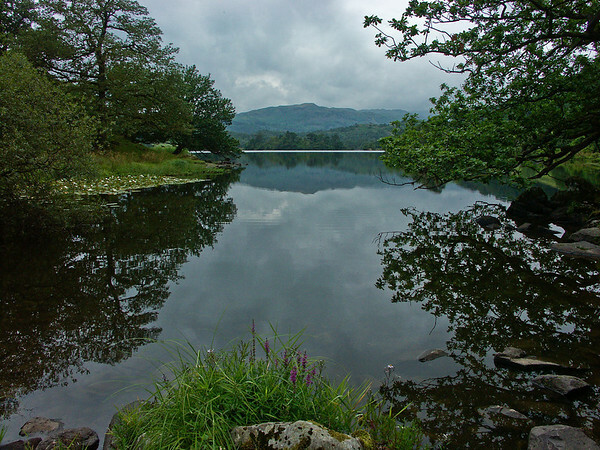 This is a shot from the very foot of Rydal Water where the bridge crosses the the stream looking north up the lake. Minolta A1 at 28mm equivalent. F7.1 @ 1/320th @ ISO 100. Programed auto. Recovery in Lightroom for the sky. Punch and Landscape sharpen presets. Blackpoint to the right.